As a musician in today’s world, it is imperative to embrace technology and allow it to give you an edge over the competition. Technology is capable of enhancing your music, while allowing you to record it much easier. Of course, there are numerous technological improvements, which can give you an edge. One of these is undoubtedly the MIDI keyboard controller. If you wish to record those beautiful keyboard melodies, you will need one of these devices. Within this guide, you will learn all there is to know about this item, so you can make the right decision for your money! In basic terms, a MIDI controller is a type of hardware or software, which creates and transmits MIDI information to compatible devices. Of course, the modern controllers are much more versatile than that. They’re capable of providing the musician with the necessary functions to control various parameters of their performance and music. The controller can be equipped with a handful of different knobs, buttons and sliders. A piano-keyboard may also be provided, but this isn’t always the case. So, what is the best MIDI keyboard controller? Further reading on choosing the right midi controller can be found here You will be able to find breakdowns for some of the best below! If you are a veteran musician or just a newbie that is trying to perfect your skills, then you will need to invest in the best budget midi keyboard. The Korg MicroKey-25 is very affordable and perfect for anyone that likes to create tunes on a keyboard. Its mini design is perfect for young inspiring musicians that like to travel, because they can toss it in their backpack and take off to their friend’s house. The Korg is equipped with a USB port, so you can charge it right from your iPad. Do not be fooled by the low price tag, because it has a lot of features that replicate the more expensive brand. This is a user-friendly device that is integrated with a joystick, which you would not expect from some an inexpensive keyboard. You will need to download the Korg M1Le app to your iPad, so you can play playback samples. The great thing about the MicroKey-25 is that it offers versatility, since you can utilize with a large array of musical instruments. Overall the Korg MicroKey-25 controller is very affordable and compact. It is very user-friendly and perfect for the newbie musician that wants to add some piano to their recordings. Q: Are the keys full size? A: No, the keys are half or maybe third the size of regular keys. If you’re looking for an outstanding MIDI keyboard, which is perfect for Logic, you will want to check out the Novation Impulse 49. This is undoubtedly the best MIDI keyboard for Logic and is great for all different purposes. At the same time, the affordable price tag should be enough to sway the majority of musicians to at least consider the investment. This device is equipped with a high precision keyboard, which will transmit each sound you produce. Those that are used to traditional keyboard will feel right at home with this one, as it is designed to feel and operate like a real instrument. The MIDI controller comes with the immensely helpful Automap control software. This gives you the ability to instantly map the buttons and faders, so you can get back to what really matters. The keyboard comes with 49 keys. The necessary USB/power supply is included for added value. More specifications can be found below. All in all, the Novation Impulse 49 is an outstanding MIDI controller, which will be sure to satisfy. The price is more than affordable, so it would be a terrible mistake not to consider making this purchase today! "Fantastic Midi Keyboard controller. Very easy to setup." - By Michael J. As a musician, you will need to stock your ﻿home studio with high-quality equipment including the best Midi keyboard for Ableton. The Akai APC40 MKII is designed with a large variety of features that will come in handy, when you are trying to perfect your recordings. This is a plug-and-play device, which is more suitable for musicians that find themselves transporting their instruments from place to place. 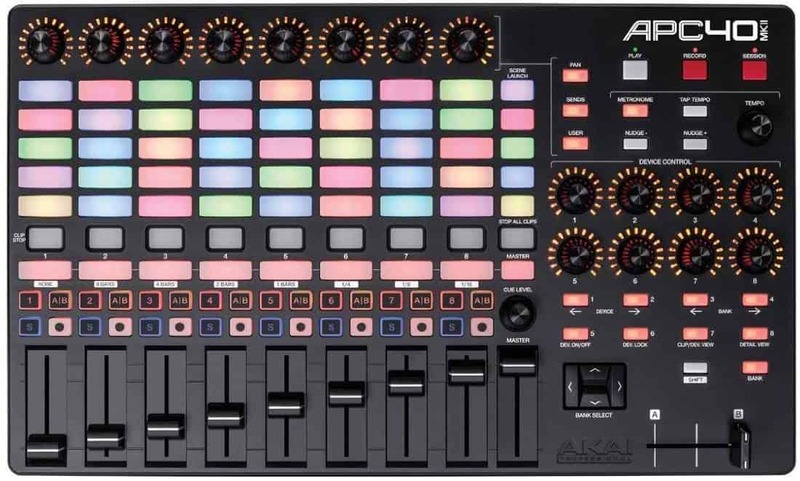 The AKAI APC40 is integrated with Ableton Live DAW software. The features are amazing and very user-friendly, but when plugged directly into the Ableton live, you will find it seamless. This is a high-quality controller that is equipped with a mixing/revised knob layout for easy use and better performance. Overall the AKAI APC40 MKII is a high-quality controller that has eye appeal. No installation required, just plug it in and begin your live performance. Over the years, USB technology has grown incredibly popular and is nearly everywhere. Musicians can benefit from the advancement, as well. With the best USB MIDI keyboard, the musician will have no difficulty connecting their keyboard to their computer or workstation. The MasterKey 49 is built for this particular convenience. Although it is immensely affordable, the keyboard is astounding in various areas! The full-size keys will be sure to provide the musician with the ability to perform their favorite songs and feel comfortable throughout the duration. It is possible to assign controls at any time, so you will always remain in full control of your music. For added value, this keyboard MIDI controller also includes the PreSonus Studio One Artist recording software. The keyboard also comes with a 6ft USB cable, which ensures that you’ll be able to start recording your music, as soon as the item arrives at your door. No driver is needed, so the installation and setup are very easy. More benefits can be found below. Many musicians are looking for value. If you fall into this category, it would be a major mistake to ignore the MasterKey 49 MIDI Keyboard. Although it is affordable, it comes equipped with many excellent features and functions, which will allow you to manipulate your music easily in real-time. For the price, the keyboard MIDI controller could very well be classified as a steal! "For the money this product is outstanding value." - By Peter I. As a musician, who wants to take full control over the piano or keyboard, it is essential to purchase the best 49 key MIDI keyboard. The majority of musicians will agree that the Novation LaunchKey 49 MK2 claims that title. This 49-key MIDI controller is great in many areas and will not break the bank! If you’re a fan of the Ableton Live software, this keyboard is for you. The combination will undoubtedly give you the ability to manipulate and alter your music, until it has reached a state of perfection. The controller is equipped with full-colour RGB pads and gives you the ability to manufacture expressive beats. The keyboard is bus-powered with a USB cable and can be used with MAC and Windows computers. It comes with 16 RGB pads, 8 knobs and control buttons. The keyboard’s keys feel very realistic and will help to ensure that the musician feels right at home. More pros can be found below. Truthfully, the Novation LaunchKey 49 MK2 is a brilliant MIDI controller, which is more than capable of enhancing the musician’s music. It is affordable, very versatile and effortless to setup and use. 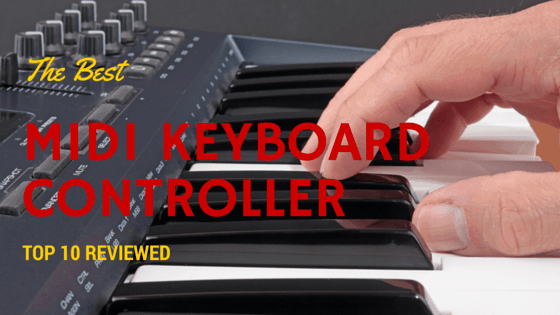 The combination of benefits makes this MIDI controller one of the best and it would be a mistake not to check it out in greater depth today! If you are searching for the best 25 key midi controllers that will not break the bank, then you should definitely consider the Behringer UMX250 U-Control. It is compatible with Mac and PC, which is exactly what most musicians would expect from their midi keyboard. It offers 50 VST effects and innumerable sound creations, so you can unleash your creative side. This keyboard is equipped with 25 notes, faders, and adjustable knobs that will help you perfect your music like no other. The Behringer UMX250 is a very user-friendly device that comes with its own software, so you can connect it to your Mac or PC. It is equipped with a USB port for charging. The Behringer construction is solid and will endure the test of time. You can also utilize the midi controller to tweak your instruments and effects. It is so lightweight that you can toss it into your backpack and forget that it is there. This is a great feature for those traveling musicians that are always performing live in various locations. Overall the Behringer UMX250 U-Control is designed to offer easy control and a long service life. "Very smart MIDI keyboard. Worked straight out of the box. I like the full size keys." - By Ray M.
Some musicians will want to obtain a more function keyboard. If you have a similar mindset, you will want to do your best to find and buy the best 61 key MIDI controller. Once you’ve scoured the market for a lengthy period of time, you will find yourself returning to the M-Audio Keystation 61. This affordable MIDI controller is very versatile and incredibly affordable. The velocity-sensitive keys help to produce a natural feel, which will satisfy pianists of all skill levels. The controller is equipped with a USB-MIDI port, which works perfectly for playing virtual instruments and controlling your favorite recording software. The MIDI controller is equipped with transport and directional buttons, which give you the ability to control your DAW directly from the keyboard. This controller comes with a variety of different functions, including pitch bend, octave controls and modulation. The keyboard is USB-powered and is plug-and-play compatible with computers and Macs. When it boils down to it, the M-Audio Keystation 61 is a great MIDI controller. If you feel the need to utilize 61 keys, you should not ignore this keyboard! The affordable price tag makes it more than realistic and reasonable for the majority of musicians. There are many excellent MIDI controllers on the market and the Behringer UMA25S is undoubtedly right up there with the best of them. Behringer has been in the game for a lengthy period of time and the majority of their products have been well received. This is definitely true with the U-Control UMA25S. The keyboard is affordable and built with 25 velocity-sensitive keys. With the built-in USB port, you will be able to instantly connect your instruments to your computer for playback and recording. The controller comes equipped with the Audacity audio editor, which is surprisingly versatile and functional. The keyboard includes 21 assignable controllers. This includes 8 knobs and 8 buttons. You will also be able to take full advantage of 2 wheels, a fader and 2 pedal ports. More pros and cons will be listed below for your convenience. At the end of the day, the Behringer UMA25S U-Control is a great MIDI keyboard controller, which is easily affordable. If you want a good controller, which won’t break the bank, this controller is well worth checking out right now! The Alesis Q25 keyboard is equipped with 25 keys and various knobs that are very easy to control. This is a plug-and-play device that just needs to be plugged into your computer or laptop. It also has pedal input, but you will need to purchase the pedal separately, but most musicians already have one. The Q25 is compatible with Ableton live lite and air music tech software. The on-the-go musician will definitely appreciate the Alesis’ compact design, because it offers portability like no other. The Octabe buttons light up, so they can be located very easily in a dark environment. The large volume slider is suitable for those with large hands and makes it much easier to make adjustments. Overall the Alesis Q25 is a very affordable keyboard controller that is suitable for the beginner or on-the-go musician. If you’re looking for an affordable, well-rounded MIDI controller, you will want to do yourself a favor and check out the M-Audio Oxygen 49 IV. As the name suggests, this keyboard comes equipped with 49 keys, which are velocity-sensitive. The user will also be able to take full advantage of 8 velocity-sensitive trigger pads, which allows the musician to produce their own beats and launch clips. The controller also contains 8 assignable knobs and 9 assignable faders. The combination will provide the musician will enough control to manipulate their music, until it is just perfect. The unit is also equipped with transport buttons. These give the musician the ability to seamlessly control their DAW, without needing to touch the computer’s mouse or trackpad. The controller comes with the SONiVOX Twist and the Ableton Live Lite. With this combination and the included USB cable, you will be able to start using the keyboard, as soon as it arrives! Truthfully, the M-Audio Oxygen 49 IV is an excellent value and will be able to help you produce the songs that you’ve always dreamed of. If you wish to enhance your music and take complete control of your DAW, you will definitely want to check out this MIDI controller right now! All in all, there are many musicians out there that would like to be able to enhance their music. Equipping yourself with the best MIDI keyboard controller is a necessity and will give you added control and convenience. Of course, finding the best one is thoroughly complicated and traveling down this road alone is unrealistic. This is why you will want to read the information above and allow it to guide you towards the best midi controller for your individualistic needs and desires!